Once again, it has been too long since my last post. Many apologizes. I know I should go to visit my Chuck boxes and gather dimensions and more photos. The weather has been less than perfect for photos, so I wait. Another mountainman skill that most should brush up on is blacksmithing. Nothing like the smell of hot coke smoldering in the forge, with a twist of burnt used motor oil in the quenching bath and the ring of the hammer on the anvil creating a new tool or weapon from the raw ingredients from the Earth. Aghh! And fire made it good!! During my travels this summer I had the pleasure of visiting many blacksmith shops across the country: L'Anse aux Meadows, Nordstead, Louisbourg, Iona, Fort William, Bar U Ranch, to mention but a few. The most intriguing new discovery for myself was the anvil carried by the Vikings. Unlike the traditional English Anvil with its large footprint to secure it to the wood block the Viking Anvil was a portable anvil, quite light on about 30 - 40 pounds. However, it has a point on the bottom. It was designed to be hammered into the wood block. So, the Vikings would cut a block to the correct height for the blacksmith and then they would hammer the anvil until it was seated to the perfect height. If the anvil was removed, simple wood wedges were employed to re-secure the anvil to the wood block. A simple, yet ingenious method of making practical and portable tools. Hard to believe the Vikings were able to secure a supply of iron from the bogs of L'Anse aux Meadows, Newfoundland. But, legend has it the Vikings recognized the tell-tale signs of the presence of iron below the peat and with much labour were able to excavate enough "bog iron" to smelt and forge enough nails to repair a damaged long boat. Of course, this repair job took around two years - because they had to build a village to survive the approaching Winter before they could resolve to repair the vessel. The top picture is of the foundry, where the "bog iron" was transformed from muddy slime to metal, the slag was discarded on the ground, to impure to even make nails. The iron bars poured at the foundry were then taken to the blacksmith shop and with the aid of the forge and anvil transformed into the 200 to 400 nails required for the repair. The blacksmith shop had a set of twin single bellows to maintain airflow into the simple forge. But, enough heat was generated to heat the iron to a workable temperature. Compared to the Blacksmith Shop at Fort William, near Thunder Bay, Ontario. The Viking Blacksmith Shop was quite primitive. The art of blacksmithing is a dying art. Once one of the most important occupations in a community, it is now merely a hobby for the many who continue to practice the art. The farrier, the blacksmith who builds horsehoes and shoes horses, is a specialty that continues on due to a love people have for their horses. But still, the numbers of farriers doe not grow and someday in the future we may run out of them, too. As with other specialties of the blacksmith trade/art (swordsmiths, armourers, knifesmiths) there are too few, spread too far apart. 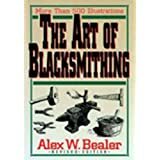 For those wishing to learn more about this art before it is gone, I highly suggest reading and practicing the lessons taught in Alex W. Bealer's The Art of Blacksmithing available at amazon.com. So, keep your fires hot and your hammer ready!